Consider this post a sequel to the most previous. First, you are letting yourself have a second can of Diet Coke on some afternoons, to stave off or recover from a nap. Then, you are feeling like you might die at 10:00 a.m., or like you might kill something… and you realize that you’d put off your Diet Coke, and once you have it, the world rights itself again. 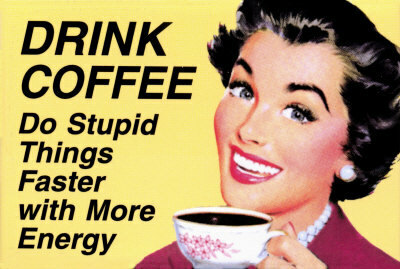 And then, you are just getting up early, so you need a little pick-me-up, to go from Asleep to AWAKE!!!! with enough time to get your work done. Then, you’re back to coffee every morning. Then, you’re up to two shots of espresso every morning. Then you’re up to two shots of espresso every morning, and an energy drink in the afternoon, occasionally, as a pick-me-up, on those long and draggy days, when you need to get things done. And then, you’re just drinking it because… you can. And because it feels good. Until your heart starts to palpitate. And your pocketbook bleeds out on Starbucks. And you’re back on that dark, twisted spiral that leads you into the abyss….